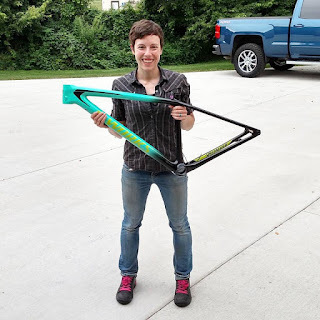 This review has been a long time coming, but I'm finally getting around to officially introduce the world to my Specialized S-Works Epic named Maui. Maui was purchased as a frame that we would build up into a very capable & fun mountain bike that would take adventures on gravel roads. I was super excited to have a lightweight and efficient bike that had capabilities of having a bottle cage! My last hardtail was a WSD design and because of that, it didn't have room for a bottle cage. I felt like I was stepping up in the world! This bike was built with a SID World Cup front suspension fork with a remote lockout. It doesn't have the brain tech like my full suspension Epic does. I don't find that to be an issue as I'm used to non-brain technology front suspension forks. Travis put on a 32 tooth oval chainring and it's an 11-speed drivetrain. 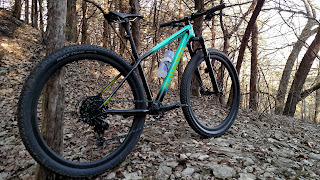 We went with the 32 tooth size so I could have gravel gearing that would suit my riding style, but also successfully ride this bike on trails. It's more important for my bikes to be able to go on mountain bike trails because that is my favorite type of riding, having the bike cross over into another territory is a bonus. I feel this ring size works well for me, and while it might not be enough for some, I find it is a good balance for my needs. I do tend to favor some of the easier gears when it comes to climbing on our mountain bike trails which is why the season prior we had changed several of my bikes to a smaller chainring to eliminate a crossed chainline (and to try and get me closer to using my middle gears more consistently.) This setup backtracks that whole concept, but I'm not using this as my daily dirt ride, so it doesn't matter too much. We put on the Roval Control SL carbon wheelset from my full suspension Epic since that bike was getting a set of sweet Industry Nine wheels. We set the wheels/tires up as tubeless (no tubes) and that allows me to run lower air pressures for trail riding. Most times for gravel riding I'm around 20-23 psi and I feel that is fine for my rides. I like having a tubeless setup so I can worry less about puncture flats, even still, I'll carry a spare tube with me just in case. I currently have the stock tire setup on the wheels: Fast Trak 2.3 in the front and 2.1 in the back. The Fast Trak tread worked quite well for the gravel rides I've gone on and I'm not sure I would feel as tho I need to go to a different style. I might consider trying the Renegade tires next year, to see if I like the lower profile. Overall, I would say I am not as confident on gravel as I am on singletrack, so I like having tires with decent traction and grip. My first ride on Maui was a pavement ride to Bluffton and back, and let me tell you, I said: "I'll never need a road bike again!" I fell in love, and I fell hard. For being a mountain bike, I felt like it was so light and nimble. It's how I wished my road bike could've felt- I felt stable and confident, yet I could stand up and crank away with ease. I would not want this bike to be any lighter than it is, because that would almost be scary in terms of handling. I would say this bike felt like a sprite as it was very responsive and nothing felt out of control. I couldn't wait to see how this bike would handle on the mountain bike trails. Fast forward a few months later and I got to find out! Riding to the trails felt so effortless and that put a huge smile on my face! On twists and turns, I felt like I could point it and go. It responded well, regardless of how tight the corners and trees were. I was surprised to feel like I could ride into turns more confidently on this Epic than my full suspension. 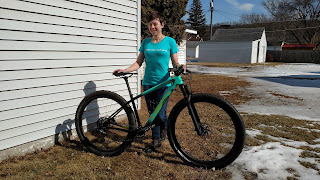 I feel the posture of my hardtail is slightly more upright than on my full suspension Epic or it's because I have a traditional suspension fork on the bike vs. a Brain fork, and somehow that makes it feel more compliant. Riding the Pines East and West trails would be the test in terms of how comfortable the bike could be on consistently bumpy terrain. There are many roots that lace within the trail and full suspension definitely keeps you from feeling so beat up. I found that the carbon hardtail absorbed some of the vibrations, and due to that, I had no issue with powering over roots at a decent clip. Would this be my bike choice for riding hours and hours on root and rock filled trails? Not likely. Did the bike handle well for riding my local trails for a couple hours? A resounding yes! I had an extremely good time riding this hardtail on my local trails. This bike was my go-to for riding trails when I would have to do trail checks after some of our larger storms this season. I quickly found the bike was ideal for my exploration rides due to its weight. Have to climb over a tree (or five?) or jump across a natural stream? Easy! The bike takes little effort to lift, which my shoulder appreciates. Surprisingly, I felt really confident on the bike with less than ideal trail conditions. I was able to finesse my way over slick roots and rocks as well as climb up hills in relatively greasy conditions. I found that this bike was a winner in dry or slick conditions. 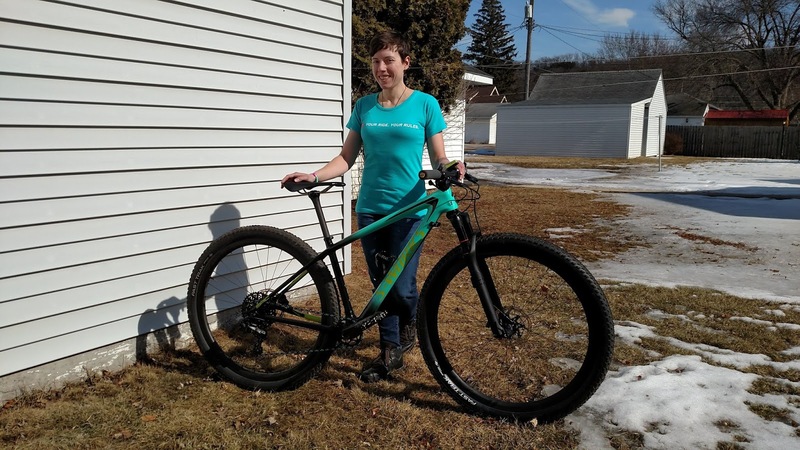 I have not ridden this bike in a race yet; It's not something I'd consider taking to Chequamegon due to how that course typically is, but I might consider riding it for our local Time Trials. I had fallen hard for full suspension and this bike made me appreciate the joy that riding a hardtail can bring. You don't have rear suspension cushioning bumps, and it doesn't aid you with climbing- you learn how body position can affect the ride. It's been really fun to jump back on a hardtail after riding a full suspension so regularly. I'm really stoked to have Maui in the fleet and I can't wait to ride this bike more next season!